Issues that dominated the political discourse in 2015 are all back in focus, hotly debated in and outside parliament, in the media, and at tea stalls across Sri Lanka. No one is yet talking about the Sri Lanka elections, scheduled to be held in 2020, a year after the Indian Lok Sabha polls. While all eyes are on the Indian election, politicians in Colombo appear to be nervous about political stability. Issues that dominated the political discourse in 2015 are all back, hotly debated in and outside parliament, in the media, and at tea stalls across the country. The 2015 election was bitterly fought between the then President, Mahinda Rajapaksa, and his main rival and cabinet colleague, Maithripala Sirisena, who strongly condemned the former’s attempts to tilt the country towards China. The Hambantota port project was offered to China, as were a number of other projects, including the $1.4 billion land-reclamation project undertaken by China Harbour Engineering Company. The anti-China sentiment created fear among the people, especially the Buddhist clergy, who promptly got Rajapaksa defeated. But, ironically, the new government did not only clear the projects given to China, but went a step ahead and awarded more projects to Chinese companies. As of now, Colombo is spending more than seventy five per cent of its revenue repaying its debt to China. This has obviously led to cuts in development and social sector projects, resulting in deep resentment among people. Even Prime Minister Ranil Wickramasinghe himself has warned developing countries against replicating the Sri Lanka model (of getting projects completed on loan). In fact, during the 2015 election, Sirisena’s favourite election slogan was “we don’t want to be slaves again”. To circumvent the debt burden, Sri Lanka has decided to allow the sale of Hambantota to China through a long lease running into almost a century. Interestingly, this prime project is in the constituency represented by none other than Rajapaksa. Again, ironically, the very same clergy that opposed the project earlier are strongly backing the deposed President. As was expected, Rajapaksa is having the last laugh. Mounting a scathing attack on the present government, Rajapaksa has questioned not only the silence of Sirisena while he was a minister in his cabinet, but also his total consent to the project, including the credit agreement clauses discussed in detail at the time of awarding the contract. He has also raised the issue of equity swap by the present government leading to ‘Sri Lanka becoming a slave (of China) again’. Yet another huge embarrassment for the government is the ongoing strife between a section of the Buddhist clergy and the Muslim population, especially in the fishing villages. “Even a decade back, one could not spot a single woman in a black veil (burka) anywhere in Sri Lanka. But now you see them everywhere,” said the monk at a popular Buddha Vihara in Colombo. Though the clergy and important religious organisations condemn the Buddha Bala Sena and their vandalism, they do not want to do so openly. There is an uneasy feeling in some political quarters over reports that the Buddha Bala Sena could gain popularity and tilt towards Rajapaksa, thereby lending him the much-coveted support of the clergy. To add to the trouble, the Tamil National Alliance (TNA), a partner in the government, has racked up the three-decade old Rajiv-Jayawardene Accord of 1987. TNA leader and veteran Tamil politician R. Sampanthan said recently, “Our journey continues, we need the (1987) accord, we need to ensure that the ‘spirit’ of the accord is implemented and India must do its duty to ensure the same. It is India’s duty and India cannot get away from that duty.” The accord was one of the factors that created a rift among Tamil groups, leading to Prabhakaran launching the LTTE as the sole representative of the Tamils. 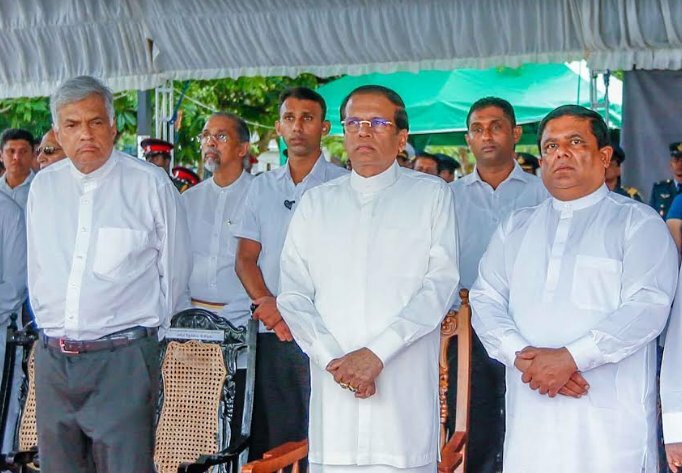 At a time when the country is heaving a sigh of relief and the LTTE is gone and forgotten, TNA leaders’ reference to the ‘spirit’ of the accord has come at a bad time for Sirisena and his government. The allegation that the ‘Government of National Unity (GNA)’ headed by Sirisena and Ranil has surrendered before the UNHRC, which is still probing alleged army excesses committed during the last days of the 2009 war against the LTTE, is gaining momentum. Rajapaksa, for all his faults, is still seen as the man who defeated the dreaded terrorist organisation LTTE, and prevented the country’s partition. Though a recent amendment to the constitution makes it impossible for him to run for presidency, nothing stops him from holding power by proxy and then amending the constitution in his favour. The author is a security and strategic affairs commentator, and former editor of ‘Organiser’.